“I’ve worked with the best cats around, and Nicky is one of a kind! This sweet and soulful jazz cat followed his dream and came out a winner. “You have never heard quite a version of “Three Blind Mice” such as this one. 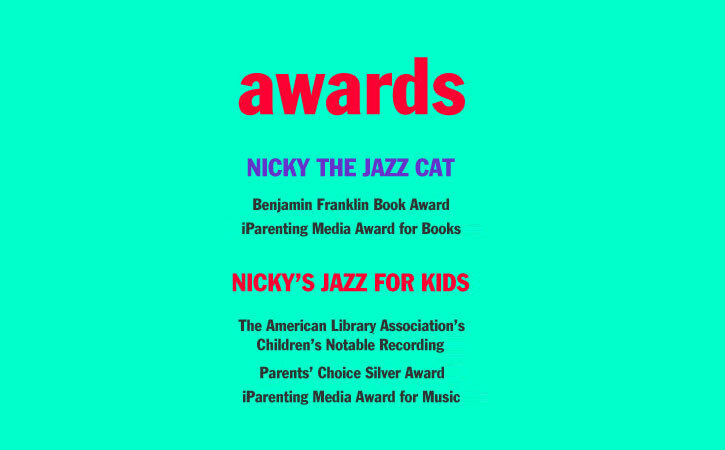 your children is high, Nicky’s Jazz For Kids will most certainly fit the bill. Jones, Lena Horne and Lionel Hamptonall cuddling with Nicky, Friedman’s cat. well as a jazz photo book either for children or animal lovers. has found awhole new way to expose their humanity. and adopt both kitties and kiddies. Nicky is a small black cat who was adopted by New York photographer Carol Friedman. few of Friedman’s clients could resist the charms of this little bundle of fur. whom are such legends as Lena Horne, Gerry Mulligan and Lionel Hampton. wants to introduce their children to the wonders of music with the help of a cute little friend.